You finally summoned the courage to speak to him/her or you feel that you are both now really beginning to connect and are ready to move the relationship to the next level and then he/she starts setting up boundaries. When this happens, the conversation that sometimes goes on in your head usually sounds something like this “…Wait…what? We just turned a page and now you want to put ‘walls’ between us…” This is a normal reaction as most people often see boundaries as a negative thing that will kill spontaneity and romance. However, unlike a certain wall in the western hemisphere being built to ‘create a chasm’ between one half of a continent and another, boundaries in relationships work more like a bridge. A relationship boundary is a limit or expectation placed between you and your partner (‘partner’ refers to boyfriend, girlfriend, husband or wife). They are guidelines created in a relationship to identify reasonable, safe and permissible ways for other people to behave towards them. The purpose of a boundary is not only to protect yourself so that you can maintain a sense of self but it will also bring you to a deeper level of understanding and connection as a couple. In other words, boundaries are set to help educate instead of isolate. 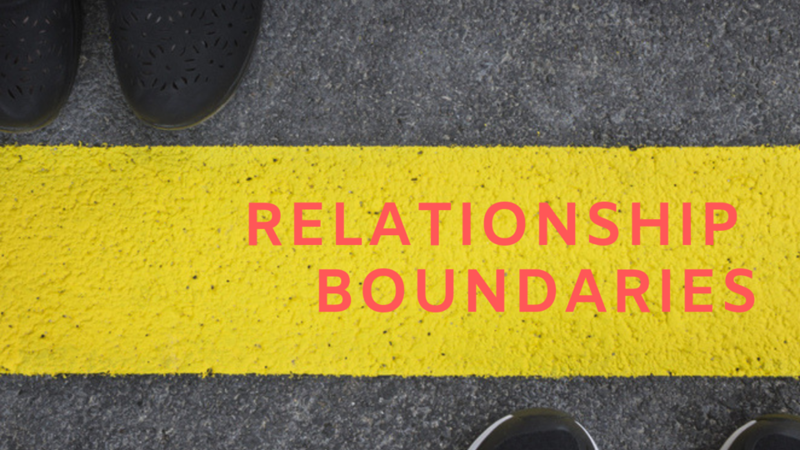 Boundaries, which can be set either subconsciously or actively, are rooted in our belief systems and influenced by culture, upbringing, religious views, life experiences and bonds amongst others and as such are critical in ensuring that your relationship does not sink when it should swim. But why is it really necessary? For starters, setting boundaries forces you to ‘know yourself’ and your own limits. You cannot expect someone else to know what you like or dislike when you have not yet figured it out for yourself. Secondly boundaries ensure that you do not get taken advantage of especially if you are a giver as observed by Henry Ford when he said “…Givers have to set limits because takers rarely do…” It protects you from being maligned, dominated or pushed around in your relationship. Finally, boundaries, when respected, strengthen relationships and brings the couple together because it requires open communication and willingness to see from a different perspective. There is mutual understanding and a deeper insight into what makes each other tick. One question we need to ask is – is it easy for men and women to agree on boundaries? The saying “…Men are from Mars and Women are from Venus…” was coined because men and women see and respond to things differently in relationships. Nearly all women are generally more willing to set and accept active boundaries, but some men (especially in Nigeria) have not adapted to the evolution of the social construct. And as such they still see or act as if the world was essentially still a “Man’s World”, pushing against boundaries especially in marital relationships. Often, men feel that once they go into a relationship, they automatically own rights to all aspects of the other person. They feel and consequently act as if their partner is their possession. This can make what should be a loving and mutually beneficial connect, a living nightmare for the woman. Now, men; don’t bite my head off. I have just taken an extreme scenario to highlight the danger of not setting boundaries. This situation can also happen with a woman being the culprit although not as common. Now it is possible to love someone but find yourself pushing against the boundaries they are trying to set. You may start to think there is no hope for the relationship as you have not been able to find a way to make sense of his/her requests. Do not be despondent, instead focus on trying to understand why he/she needs that boundary and how you can compromise. And if that does not work, still hold on to your hope by channelling the love you have for him/her and remember that “…Love never gives up, Love is kind, Love cares more for others than for self, Love doesn’t force itself on others, Love puts up with anything and Love keeps going to the end…” (Paraphrased from 1 Corinthians 13:3-7 MSG).